Join us for a pontoon boat tour on Lake Dora and The Harris Chain of Lakes. Our 2-hour tour includes the famous Dora Canal, which has been described as “The most beautiful mile of water in the world.” As we cruise, our certified captains and crew will share their stories and local knowledge of the area, its history, flora and fauna. Bald eagles, herons, anhingas, turtles and alligators are all common sightings during our tours. We are conveniently located at the historic Lakeside Inn (100 N Alexander Street) in downtown Mount Dora, just 45 minutes north of Orlando. Premier Boat Tours offers you the best pontoon boat rides and canal tours in all of Central Florida. 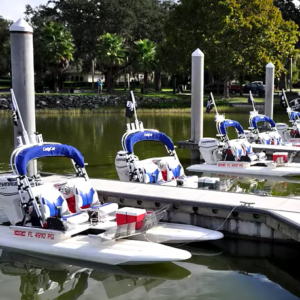 Our one hour city tour begins at the Segway dealership building in downtown Mount Dora, travels along side of the town’s expansive waterfront and city marina, runs out to the famous Mount Dora lighthouse and over to Palm Island Park. In the Palm Island Park we traverse some of the most intriguing nature paths in Florida and explore the raised boardwalk over the water’s edge, allowing the riders an opportunity to view our abundant wildlife and variety of plants up close and first hand. You will then leave the Palm Island Park and head out through beautiful and historic neighborhoods while riding by several of the town’s well known and historic Bed & Breakfasts’. The tour will then turn back towards town via the Historic Lakeside Inn which was built in 1883 and still retains its original charm. After enjoying the gorgeous view westward across Lake Dora you will begin your return trip back through town to our home base on Alexander Street. The wish of “Taste of Our Town Tours” is to give our guests a sample of how local Mount Dorian’s live daily. People who live in our town are attracted to a certain life style. This includes gathering with friends and family while enjoying wonderful food, a glass of wine and the outdoor beauty which often includes a perfect sunset over Lake Dora. Mount Dora is a quaint and inviting town with enchanting history and culture. We desire to share a “taste” with each one of you. Enjoy a 1.5 hour boat cruise thru the dora canal with Premier Boat Cruises, drop off at the Tavares Seaplane Base to enjoy a 15 min seaplane flight, followed by a narrated train ride back to Mount Dora aboard the Royal Palm Railway Experience. CatBoat Tours – Drive your own boat! 120 Minute – Guided and Narrated tour. See Lake Dora & cruise the spectacular Dora Jungle Canal. See the history and wildlife in both. Tours are only $65 per person plus tax and fees when booked online! This site is property of WTDI, LLC. All rights reserved.